Sister Marilyn Harris, SNJM departed this life on December 9, 2017 at Marie Rose Center, Mary’s Woods at Marylhurst in Lake Oswego, Oregon. Sister Marilyn had celebrated 99 years of life and 79 years of religious profession. 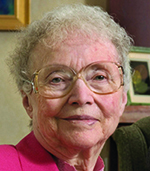 Sister Marilyn Harris (Alice Harris), age 99, died at the Marie-Rose Center at Mary’s Woods at Marylhurst in Lake Oswego, December 9, 2017. A member of the Sisters of the Holy Names of Jesus and Mary for 79 years, her Mass of Resurrection will be held at 11 a.m., January 4, 2018, in the Chapel of the Holy Names, Lake Oswego, Oregon. Daughter of Arthur and Lula Molohon Harris, Alice grew up in southeast Portland, attending St. Ignatius Grade School and St. Mary’s Academy. She followed her older sister Lucille (Sister M. Bernard Francis) into the Sisters of the Holy Names, entering in July 1936 and receiving the name Sister Marilyn. She also had two brothers who were ordained priests: Bernard, a member of the Society of Jesus, and James, a priest of the Archdiocese of Portland. Sister Marilyn began her ministry career working with first graders and continued as a primary grade teacher in Holy Names schools in Portland, Salem, St. Paul, Coos Bay, Astoria, Medford, Seattle and Spokane. For several years while she was a teacher in charge of a primary classroom, she also taught a junior high course in science, a subject she dearly loved. During this time she earned a bachelor’s degree in education at Marylhurst College and a master’s degree in life sciences and geology from Oregon State University. When she left full-time teaching, she continued her service in education as a Chapter 1 coordinator and teacher for Portland Public Schools and as a teacher’s aide at Our Lady of Sorrows School, Portland. Upon retiring Sister Marilyn spent many years as a member of the community at Mary’s Woods, well known for her spirit of friendliness and hospitality. She warmly welcomed newcomers to the Mary’s Woods community and was present at the daily 7 a.m. gathering with several other residents for morning coffee. She also scheduled players and was hostess for the daily pinochle game and, even if you didn’t know how to play pinochle, you were still welcome as Sister Marilyn would reply, “We’ll teach you.” She was an engaging conversationalist with a wide range of knowledge and a subtle sense of humor. Sister Marilyn was also a lover of jigsaw puzzles, the sort with the many, many pieces, and was seen every day at the puzzle table testing pieces for a proper fit. Sister Marilyn is survived by her nephew John Beem (Vancouver); cousins Mary Alice Enright and Glenda Bell (Portland), Joan Raber (South Bend, Indiana), Rita Putnam (Galveston, Texas) and numerous other cousins; and members of her religious community. Remembrances may be made to Sisters of the Holy Names, P.O. Box 398, Marylhurst, OR 97036 or online at www.snjmusontario.org/donate.